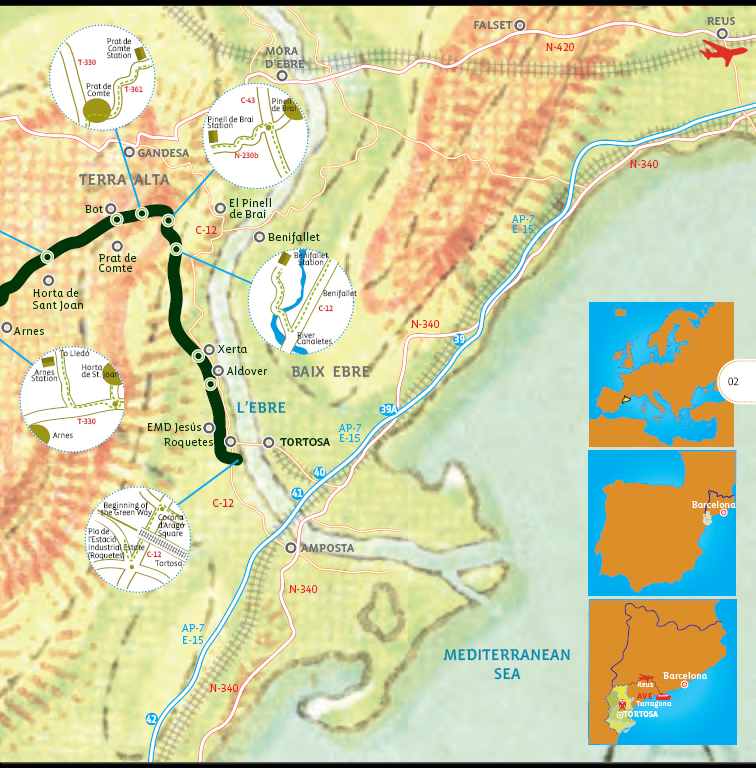 An old railway linking the towns of Alcaniz and Tortosa (Counties of Terra Alta Lower Ebro and Matarraña), renovated & often paved, to offer an amazing cycling/walking route for all ages/abilities. Features: Elegant arches – Ravine – Pine Trees – Barranc de la Balloca ravine. 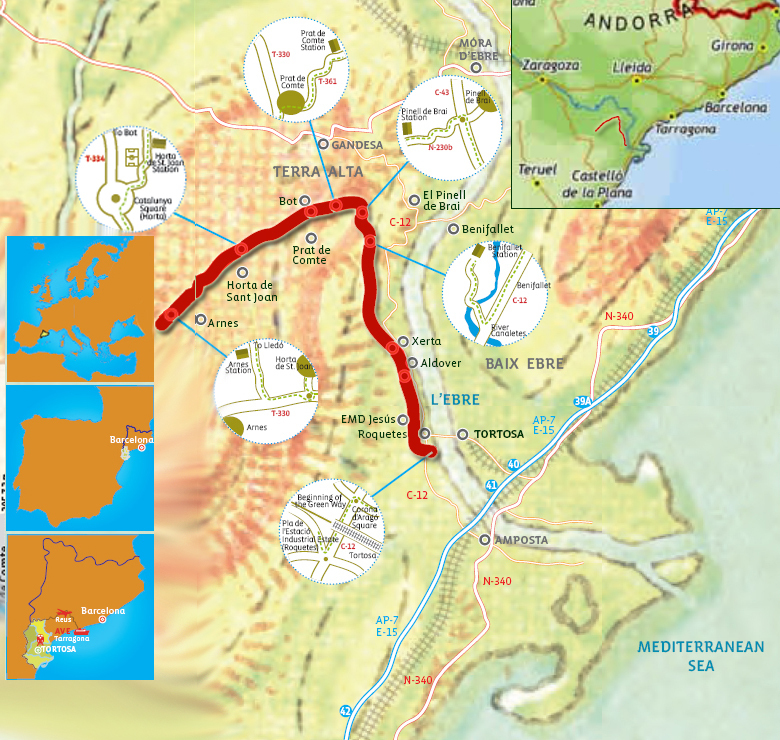 One can continue on the Baix Ebre Greenway for a further 26 km towards the Ebro and Tortosa, emulating the journey of the “Sarmentero” (The Vine Cutter) train. It passes through some amazing scenery, mountains & local landmarks (e.g. the mountain of Santa Barbara, the Sanctuary of Fontcalda, river Ebro) and has old train stations, along the way. Location: between Tortosa and Arnes-Lledó. Municipalities: Tortosa, Roquetes, EMD Jesús, Aldover, Xerta, Benifallet, Pinell de Brai, Prat de Comte, Bot, Horta de Sant Joan and Arnes. 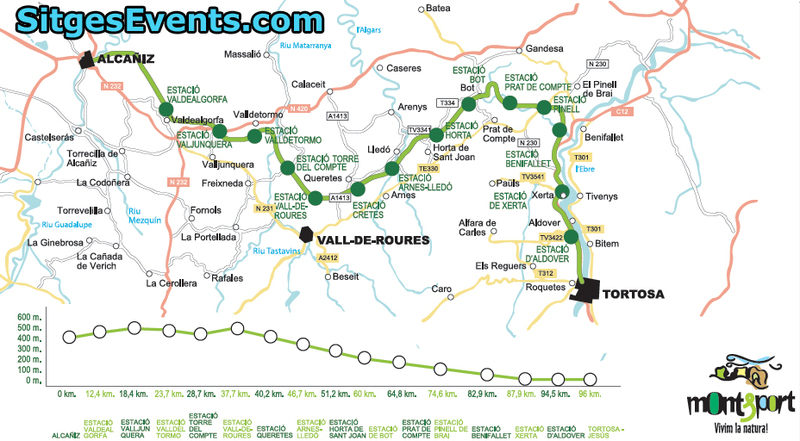 From there it joins up with the Aragon Green Way. Suitable for walking, horse riding and cycling. Accessibility: suitable for the physically handicapped. Recommendations: good shoes, water bottle, spare inner tube and torch. railways stations, recreational areas and bridges. Drinking water points: Aldover, Xerta, Bot and La Fontcalda. Kilometre 0 of the Green Way is at the end of the old railway bridge across the River Ebre, in the municipality of Tortosa. The beginning of the itinerary is indicated by some large stones and the remains of rails. Tortosa is the capital of Baix Ebre County and we recommend you visit the Reials Col·legis (Royal Colleges) (16th century), La Suda Castle (10th century), Santa Maria Cathedral, the convents of Santa Clara (13th century) and La Puríssima (17th century) and the Episcopal Palace (14th century), among the many interesting buildings in the Old Town. Departing from km 0 and following the route of the railway line in a northerly direction you come to the town of Roquetes, on the right bank of the Ebre. Worth seeing in the original part of town are the church (1829) and the old Town Hall (1881), as well as the Ebre Observatory (1904). Passing by an old bridge, you come to the headquarters of Els Ports Natural Park, after which you cross a road and continue straight on towards the village of Jesús. Following a section of the Green Way shared with vehicles, you cross the Vall Cervera gully and come to the recreational area of Jesús in Terrer Roig. In Jesús you can visit the church of Sant Francesc (18th century) and the Enric d’Ossó museum-house. Leaving Terrer Roig, taking care when crossing the road, you join up again with the railway line to get to the village of Aldover, where you find the first railway station. You pass through the village, where we recommend a visit to the neoclassical-style parish church of La Nativitat de Nostra Senyora. Leaving Aldover, you take the underpass below the C-12 road. After Aldover, you come to the first of the tunnels on the line. A few metres before reaching the municipality of Xerta, there is a sign indicating the end of the path. Here, you depart from the original route of the line and head to the left, descending a steep slope and crossing the C-12 below one of the old railway viaducts. Next, you pass under the C-12 road bridge. After a few metres there is a STOP sign, as you have arrived at the Xerta road, opposite Les Moreres recreational area. On the outskirts of Xerta you can see the magnificent Assut or weir, located right in the middle of the River Ebre. Built in the 15th century, the weir is an engineering work in the Arab tradition, some 370 m long and 7 m high. The path continues through a series of tunnels and over bridges until it reaches Benifallet station, some 4 km from the town. You have already covered twenty-one kilometres since leaving Tortosa. We recommend a visit to Benifallet, on the opposite bank of the River Ebre. Of particular interest are the hermitage of La Mare de Déu de Dalt or El Calvari (13th century) and the neo-Gothic convent building, among others. However, the most outstanding and best known feature of Benifallet is the beautiful Meravelles Caves. The Cardó Valley is also in the same municipal area. After leaving Benifallet station, you go through a series of tunnels of different lengths, the longest of which is 749 metres. 11 Tunnels between Benifallet and Pinell de Brai stations. La Riberola bridge across the River Canaletes marks the border between Baix Ebre and Terra Alta counties and takes us to the first station in the Terra Alta, Pinell de Brai. Pinell de Brai station is 6 km from the town, which is reached by the N-230b road. The most interesting place to see is the Modernist-style cooperative wine cellar designed by Cèsar Martinell at the beginning of the 20th century. The building is the finest example of the cooperatives built by this disciple of Gaudí. It exudes the Modernist style and also has a magnificent glazed ceramic frieze by Xavier Nogués on the façade. Five kilometres from Pinell de Brai station you come to the Sanctuary of La Fontcalda, a site of great beauty and religious significance with thermal waters. This is an obligatory stop for all travellers along the Green Way. Set in a valley on the banks of the River Canaletes, it takes its name from the mineral-medicinal hot spring that gushes forth at the foot of the sanctuary. The clean, transparent waters invite you to bathe in the natural pools. After going through two tunnels, you come to the station of Prat de Comte, a town located 4 km from the Green Way and reached by the T-361 road that comes out behind the station. Of interest in the town is the Renaissance-style church of Sant Bartomeu (17th century). After Prat de Comte station it is common to find works of art along the Green Way. These are part of the “Art al Ras” project sponsored by the Terra Alta county council, which places works of art along the paths linking the towns and villages of the county. Just after Prat de Comte station you come to the longest tunnel on the itinerary (749 metres). Between here and Bot the route crosses the last bridge over the River Canaletes, the Pàndols Mountains and passes by the hermitage of Sant Josep. Bot station is right in the middle of the line and next to the town, where we recommend a visit to the Renaissance-style church of Sant Blai (17th century). There is a path in front of the station that leads to the hermitage of Sant Josep (19th century), located on the top of a hill from which you have a fabulous view of the town, the River Canaletes and the Pàndols and Cavalls Mountains. Alongside the hermitage is the Forat de la Donzella recreational area. The Green Way continues in the direction of Horta de Sant Joan. Six tunnels and two viaducts, with up to eleven arches, make up this part of the itinerary. As you go higher, the mountains of Els Ports Natural Park begin to come into view. The sight of Santa Bàrbara Mountain tells you that you are about to arrive at Horta de Sant Joan station. The town is two kilometres from the Green Way and is reached by a path that begins opposite the station, once you have crossed the Green Way over a narrow bridge. The same path also takes us to the Convent of Sant Salvador (13th – 17th century) and the nature area known as “Racó de les Olles”, a place of great beauty and the ideal spot for taking a dip in the waters of the River Canaletes. In the town you can visit the Els Ports Ecomuseum and the Picasso Centre and a stroll around the mediaeval quarter is a must. There are only five kilometres between the stations of Horta de Sant Joan and Arnes-Lledó, the latter of which is located next to an imposing concrete bridge that crosses the River Algars, a site for adventure sports. If you follow the signposts from the station you will find the municipality of Arnes, five kilometres from the Green Way. Stop for a while in the Plaça Major (main square) to admire the wonderful panoramic view of Els Ports. The historical quarter of this village, located at a height of 508 metres, has been declared a Cultural Interest Site by the Catalan Regional Autonomous Government and is particularly interesting for its town hall housed in a 16th century Renaissance palace. You can also see the ruins of an old church alongside the present-day 17th-century building dedicated to Santa Magdalena.